Changing your major is a multi-step process and specialized to each major. This website is to be used as a guideline. Students must have conversations with appropriate offices and departments to see if changing their major is possible. Students must complete at least one quarter at Cal Poly before they are eligible to enter into an Individualized Change of Major Agreement (ICMA). Students are expected to research their options and make a well-informed decision before entering into an ICMA. This includes attending workshops and conversations with advisors and departments. Students are allowed one ICMA per major. Students who do not meet the conditions of their ICMA will not be issued another ICMA for that major. Change of major is not guaranteed, but it is possible through the policies that we have set up for each major. Criteria may change as demand changes for each major. 1. Log onto your Cal Poly Portal. Click on the ACADEMICS tab. 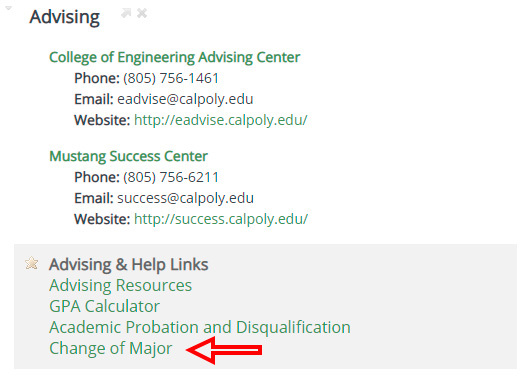 Click on the "change of major" link on the bottom right of the page. 2. Select box labeled "I want to attend a change of major workshop". 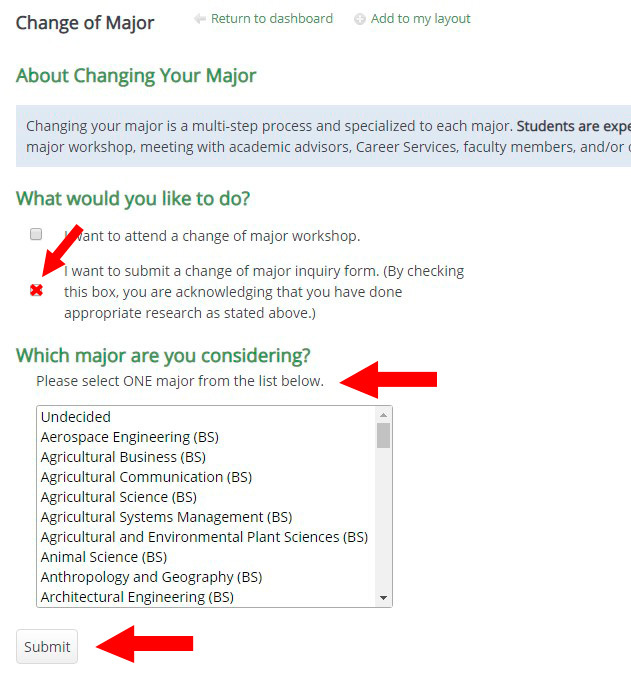 Select ONE major from the drop down menu and click "submit". 3. Select the workshop you want to attend. 4. 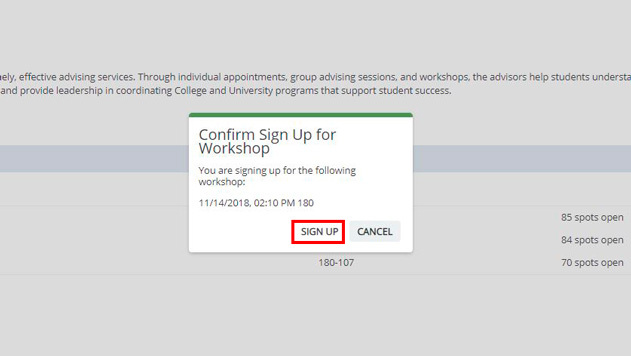 Click "sign up" to confirm the workshop you want to attend. If you try to sign up for a workshop and it says it is full, we suggest that you still show up. We will try our best to accommodate all students that show up for a workshop. If there are not any more workshops available for this term, or you have any follow up questions about change of major, please contact the Mustang Success Center in building 52 or call at 805-756-6211. Further details on changing your major to a specific major can be found on the advising website within that respective college. We encourage students to look at these requirements and bring their questions to the workshop. The workshop will provide a path for the next steps. 2. Select box labeled "I want to submit a change of major inquiry form". Select ONE major from the drop down menu and click submit box. 3. Complete the eligibility inquiry form. Each response has a 2000 character limit, including whitespace. Exceeding the character limit will result in the inability to submit your inquiry. Once you have submitted an inquiry form, you will receive a confirmation email from success@calpoly.edu. The subject line of the confirmation email will read, “Change of Major Inquiry Form Received”. The change of major coordinator for your desired major will evaluate your eligibility and inform you of your status within 10 academic business days. Log onto your Cal Poly Portal. Click on the Academics tab. Click on the "change of major" link. You can view the status of your inquiry under the Change of Major Inquiry Form Details portlet. The default status of a new inquiry is “Requires Attention”. This status indicates that an inquiry form has been submitted. Eligible: Student meets initial change of major requirements to proceed to next steps of developing an Individualized Change of Major Agreement (ICMA) as outlined in the email from the Change of Major Coordinator. Not Eligible: Student does not meet initial change of major requirements to proceed to next steps for developing an ICMA. An advisors from the Mustang Success Center will reach out to the student to help determine next steps. Pending Further Action: Student eligibility for an ICMA is dependent on additional information. Student must proceed with next steps as outlined in the email from the Change of Major Coordinator. You will be notified by your Cal Poly email account within 10 academic business days of updated status and the next steps you will need to take. Follow the directions outlined in the email. A student can only have one (1) active inquiry form. 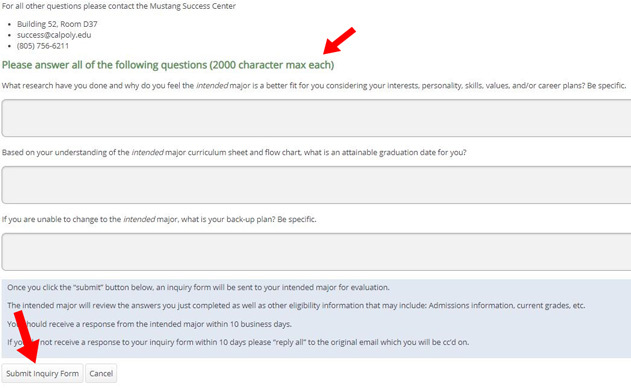 In order to submit a new inquiry form for a different major, the student will either need to a.) withdraw their current inquiry form through their portlet or b.) be deemed “not eligible” by the Change of Major Coordinator. 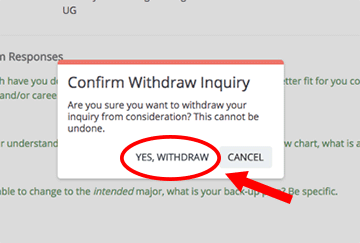 You can withdraw your inquiry at any time during the inquiry process by clicking the “Withdraw” button under the Change of Major Inquiry Form Details portlet. To confirm the withdrawal of your inquiry, click the “Yes, Withdraw” button in the pop-up window. Once an inquiry has been withdrawn, the status of that inquiry will be listed as “WITHDRAWN_BY_STUDENT”. To submit a new inquiry, click the “Start New Inquiry” button under the Change of Major Inquiry Form Details portlet. Students who have submitted a Change of Major Inquiry Form will receive an email to their Cal Poly email account from the Change of Major Coordinator. Students will be asked to follow the instructions as outlined in the email. If you do not hear from anyone within 10 academic days, contact success@calpoly.edu. Please note, weekends and academic holidays are not counted as academic days. If you are not eligible to switch into your desired major, please use the resources below to help you determine the best fit for your academic and career goals.